Job Seekers!! Need a ride to the Career Fair at ONC BOCES on February 6th? A&D Transportation is offering a free ride from the CDO Workforce Center, 12 Dietz Street in Oneonta to the Career Fair at ONC BOCES in Milford and back. Space is limited, so make reservations now, call the CDO Workforce at 607-432-4800 x 100 to reserve your seat. 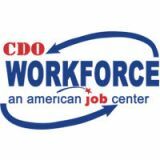 A&D Transportation's van will be leaving CDO Workforce at 5pm with the return trip at 7:00pm from BOCES. Don't forget reservations are required. Special thanks to A&D Transportation for their generosity.